I saw him move like a wisp of cloud dancing across a winter lake; yet within lay the power of the dragon. Younger students practicing so intensely paid no attention to him. He was older and not necessarily a man that you would give a second glance. While they pushed and punched their bags causing them to swing wildly, he looked as though he could push over mountains without effort. I watched this scene for awhile: the contrast between the youths and this older man was striking. It was like watching tiger cubs playing around a mature tiger. Every move he made spoke volumes of practice and study. His eyes were pools of deep blue calmness that reflected the chaotic commotion of those around him. As the younger students finished their workout, sitting down, wiping up the sweat, and gulping down water to quench the thirst of the effort they had just put out, the older man quietly changed his shoes and walked out the door of the gym. But it was the way he used his eyes that really stood out. As he danced though the bags, he never seamed to be staring at any particular one, yet he comprehended everything around him. Then it stuck me: he was merely using his peripheral vision. 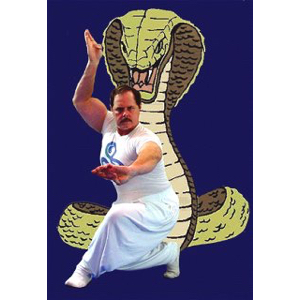 Thus began my journey into the Kung Fu world of Dr. John Painter, peripheral vision and Jiulong Baguazhang. Typically, in Western society, we use what is known as foveal vision; we focus on one point in front of us and observe all the details about that one point — watching TV, looking at a computer screen, reading, or talking to someone — and ignore everything else around it. The other kind of vision we use is peripheral vision. This type of vision takes in the whole scene in front of us and around us. The human visual system has two types of photo-receptors, rods and cones. These two types of photo-receptors are distinct in their response to light, their position on the retina, and their role in producing visual images for the brain to interpret. Peripheral vision relies on the area of the retina that is dominated by rods. Rods are very sensitive to light but do a poor job in detecting color; there are also far denser ganglion nerve connections between rods than between cones. Since rods dominate the periphery of the eye, they are more sensitive to motion too. Cones respond to radiation to produce color vision. Long (red) and middle (green) cones predominate in the fovea, with some short (blue) cones also present. The relative density of short cones increases in the foveal vision region. Throughout the peripheral region there is a low density of all three types of cones. 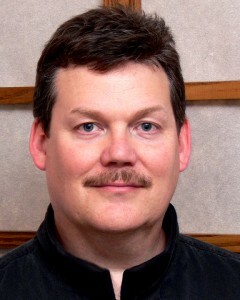 When you use peripheral vision, you may experience certain physiological changes, perhaps a shift in your breathing from high up in your chest to lower in your abdomen, to a point we in the Jiulong Baguazhang arts call the dantien; a relaxation of your face and jaw muscles; and eventually warmth in the hands. If you normally have “internal conversations” – thoughts bouncing back and force in your mind — you may have notice them quieting down or stopping altogether. Foveal vision is directly associated with stimulation of the sympathetic (involuntary) nervous system. The sympathetic nervous system seems to be linked to adrenaline secretion and stress manifestations which can trigger the “fight or flight” response. Peripheral vision is linked with the parasympathetic nervous system, which slows the heartbeat, increases glandular secretions, relaxes the digestive system and is strongly associated with: spontaneity, creativity, relaxation, calmness, intuition, wisdom, and feelings of elation. Deliberate use of peripheral vision increases stamina when engaging in physical activity. If you are actually in the peripheral vision state, you can prevent anxiety as the two states are physiologically incompatible. Peripheral vision AKA Soft Vision allows you to see and respond faster than focusing on a single spot. Peripheral vision was recognized and applied in numerous ancient cultures as a tool for survival. One example from hunter-gatherer cultures is the use of peripheral vision while hunting. It allows hunters to recognize the movements of birds and animals, and to make positive identifications without actually looking directly at the movement. Using peripheral vision allows one to see and observe motion, to navigate safely, and develop keen night vision. It also can disperse fears and stress thereby allowing you to see things for what they are. 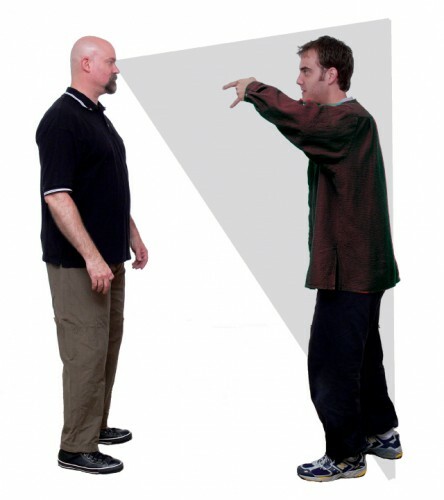 In Jiulong Baguazhang, peripheral vision allows us to be aware of any movements an opponent would make with his hands or feet, while keeping the whole of his body within view. That is useful when dealing with more than one person. A simple exercise to help develop your peripheral vision is to find a point on the wall straight in front of you and focus on it. Now gradually become aware of what is around it and let your vision spread out so you can see the floor and ceiling along with the corners of the room. As you continue to allow your vision to spread, slowly stretch out your hands to either side of you, until you find the point at the edge of your vision where you can only see your hands when you wiggle your fingers. Now continue to expand your awareness so it also spreads around and behind you. Now while you cannot literally see behind you, your senses of hearing, touch, smell and spatial awareness spread out as as well. Notice what adjustments occur in your physiological state while doing this exercise. 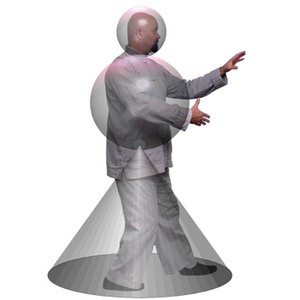 In Jiulong Baguazhang, peripheral vision, or as we call it “Soft Focus”, is very important. So let’s look at in terms of the three areas that we practice: Body, Mind, and Spirit. 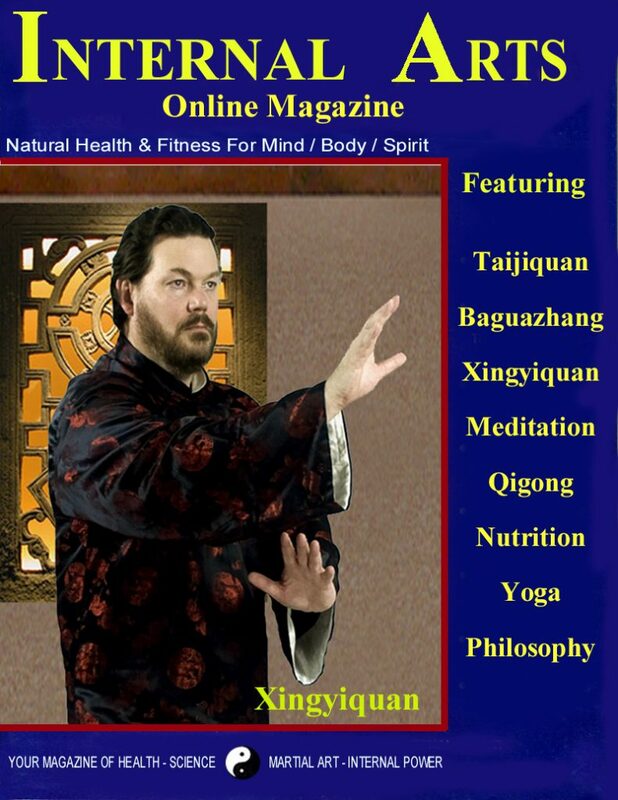 Jiulong Baguazhang encourages peripheral vision as a means to relaxed alertness. Jiulong Baguazhang circle walking is a perfect opportunity to practice working with peripheral vision. Walking the Circle requires relaxation and calmness of movement; this is exactly what peripheral vision does as it does not use a concentrated attentive focus, but a soft focus. With the arousal of the parasympathetic nervous system through peripheral vision, your movements should become relaxed and calm. In contrast, foveal vision will induce your body to move in short blocks of movement. To explain this block movement, let’s look at how the foveal vision works. The visual field, though very clear in the foveal area, is only a snapshot of information obtained by quick unconscious movements of the eye. This type of information where you focus and move, focus and move will cause your body to move with jerks of motion. If we walk the circle and concentrate on looking directly at center post, we start moving with the short choppy movement associated with foveal vision. 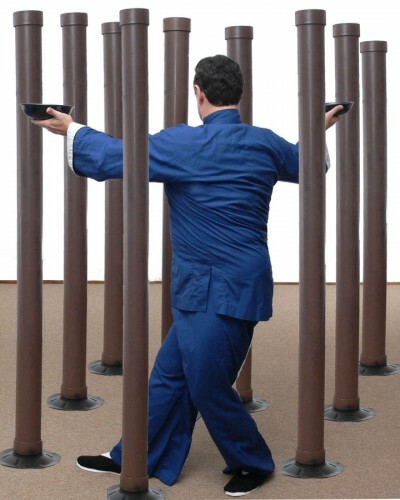 John Painter weaves through the Bagua wooden forest using “Soft Vision” skills. With peripheral vision, there is no concentrated, attentive focus on person or objects. With people, we begin to notice the rhythm of their body movements. Our bodies can understand and start to match these rhythms with our own movements. With this connective rhythm of movements in most cases, we find ourselves understanding and acting on that motion at an intuitive level, before that person can comprehend what is happen. This is not literal imitation; imitation will get noticed and understood. In Jiulong Baguazhang, the intent is to match the rhythm by making some discreetly different form of movement within the same rhythm but without drawing conscious attention to it. By doing something subtly different and noticing what they are doing in response, we can lead them into a different rhythm or possibly influencing their movement. With groups of people, if we observe them with open peripheral vision and internal quietness, we can recognize the group leaders. They are usually the people with others around them, and whose movements may be slightly ahead of the others and change first. To influence the whole group, these are the people we need to match. It is possible to establish a connection with group leaders individually, or simultaneously; we can do it simultaneously if we are within their visual field and matching their rhythm for a few minutes before engaging them. It is possible to change the direction of quite a large gathering in this way. Our modern society seems to have forgotten the value of peripheral vision. Technological advances such as literacy, television, and computers have led us to spend the majority of our time in foveal vision. Peripheral vision has a lengthy history in pre-modern cultures. In some Shamanic rituals, peripheral vision was a way to enter altered states of reality. Carlos Castaneda’s books on Mexican shamanism refer to peripheral vision as a way to a “different world”. We also can shut down the internal dialogue or ‘inventory’ with which, Castaneda maintains, we create our everyday consensus reality. Interestingly, visual hallucination can not take place within the peripheral visual system. We often see things with a kind of mild tunnel vision, where we are focused on one thing or task and ignore everything else around us. A good example of this is a rock climber climbing a crack in a rock. He is focused on climbing the crack, where his hands and feet are going to be placed in the crack, when not two inches away, out side of the crack, a nice ledge waits. This also happens when you watch TV and you don’t really notice the rest of the room; or you use a computer, whether for work or play, where the screen becomes your only world; or in reading or writing, where we only really see the page. Even in conversation, we have a tendency to focus on peoples’ eyes and faces and pay no attention to the rest of them. This foveal vision also seems to result in an inner tunnel vision. Sometimes we become preoccupied with something and lose contact with the happenings around us. Worry, obsession, and fixation seems to be correlated with rushing around; this arouses the sympathetic nervous system, thus producing adrenaline and other stress chemicals. Remember, it is hard to remain depressed while employing peripheral vision. Again in Jiulong Baguazhang, the preoccupation or fixation on accomplishing a type of training will cause that training to be mentally stressful and produce unwanted results. When using peripheral vision in our practice, we open up the mind to see the reality around us, and unlike the rock climber, see that nice ledge. Peripheral vision “recognizes” objects by deciphering patterns and textures rather than details, which is the function of central or focused vision. When you suddenly turn and notice a familiar face in a crowded room, you have already caught a glimpse of the face peripherally, processed the structure subconsciously, found it to be of interest, and then shifted to conscious, foveal vision. This process is at work all the time and is especially apparent when you are out at night. Notice how you recognize particular kinds of trees in your peripheral vision, how you know the difference between an oak tree and a pine without any awareness of the details. It’s a feeling of oak or pine that tells the difference and this feeling is supplied by peripheral vision. Since much of what is seen peripherally is processed subconsciously, you will find that using it to walk requires an act of internal spirit. This will take a bit of determination to get used to the fact that you can see without being conscious of the fact that you are seeing. But with practice, it becomes more natural, and you will find that you will have an increase in some of your instinctive but dormant abilities. It also reasons, that relying on peripheral vision while walking requires that the conscious mind develops a dependence on the subconscious: this dependence could be the essence of relaxation itself. With perseverance, you will learn to develop subconscious dependence and then there may be moments when you will be able to experience these subconscious processes directly and suddenly distinguish the objects as if in a murky fog. The peripheral vision could be possibly, our original visual system, and with the process of evolution, a central or foveal vision developed along with the neo-cortex. If this is true, when we use our peripheral vision we could be seeing as an animal sees, and perhaps feeling as an animal feels. While this is certainly speculative, we know when we are the peripheral state we feel comfortable, alert, relaxed, open, happy and very alive. The feelings of fear, anger, worry, doubt, and lust seem to be bypassed, as if the neural connections cannot support these strong emotions. This type of feeling is best described as neutral. In the development of the spirit in Jiulong Baguazhang, we begin to notice things and react in an appropriate way before we lose control over the situation. In dealing with people we can start to see past the masks of illusions that some try to use to cover their fear. This also allows the aspects of the eight gua to reveal their nature to us. I believe that this is when the peripheral vision system is working correctly and the subconscious has quit depending on the conscious for sensory information and acts on your instinctive and now active abilities. As Shifu Painter says, this is the Dragon of Jiulong Baguazhang teaching him.